For the novice online slot machine player there are a number of terms and phrases which can look a bit bemusing the first time you deposit money into a virtual casino. We have available a number of beginners guides to slots to help the first time player navigate what can be a slightly confusing road and in this article we’re going to explain what the scatter symbol is and why it’s the key to bonus games and big wins. The scatter symbol is something largely unknown to those brought up on the UK’s fruit machines; it’s a feature which is better to suited to five reel games and video slots. Fruit machines only have three reels and a traditionally different method of activating bonus games and those used to that style have a shallow learning curve ahead of them. Each online slot machine will feature usually one, but sometimes more, scatter symbols; they are nor generally high value but the benefit of a scatter comes when (depending on the rules of the game) you land three or more anywhere on the reels in one spin. It’s worth noting that it doesn’t generally matter how many paylines you are playing or whether the scatter symbols land on an active one. You can check what the scatter symbols are by looking at the ‘information’ or ‘paytable’ section while in the game but when you do eventually spin three or more on the same spin, the result is almost always a bonus game of some sort. Hall Of Gods is a good example; spin three, four or five symbols and you’ll win ten, fifteen or twenty free spins. In this game any wins you receive are subject to a 3x multiplier and it’s possible to land more scatters and win more free spins in the process. All games have their own bonus features and the above example is just one. 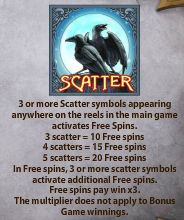 So the scatter is a randomly occurring symbol which can bring great rewards by activating the bonus features; once two have appeared on the reels, the remaining reels will light up as the possibility emerges of spinning a third.